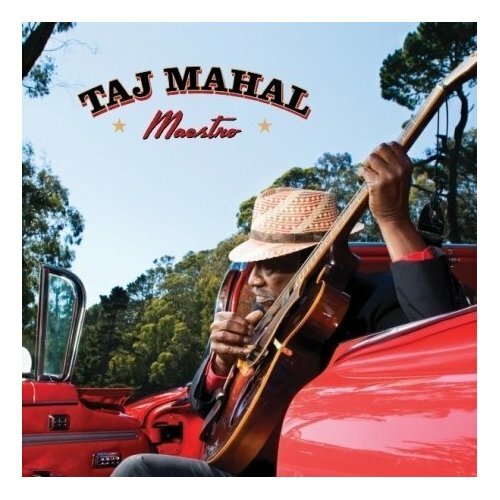 Maestro, Taj Mahal’s newest album, celebrates the fortieth anniversary of his self-titled debut with an exciting assortment of guests, including Los Lobos, Ziggy Marley, Ben Harper, and Toumani Diabate. Their collaborations account for the more eclectic tracks on this album, including the reggae-infused “Black Man, Brown Man” (penned by Taj Mahal and previously recorded for his 1976 album, Satisfied ‘N’ Tickled Too), and “Zanzibar,” which features the kora, a West-African harplike instrument. “Never Let You Go,” on which Taj Mahal plays the ukelele and is backed by Los Lobos, recalls certain soulful rock and R&B tunes from the 1960s, such as “When a Man Loves a Woman” (Percy Sledge), “A Whiter Shade of Pale” (Procol Harum), and “Maybe” (Janis Joplin). Roughly half of Maestro, however, comprises uptempo songs based on the standard twelve-bar blues format. These blues-based numbers are often laced with humor, and may deviate from expected harmonic patterns. The opening track, “Scratch My Back,” features a rhythmically jaunty musical arrangement and playfully suggestive lyrics; these qualities remind me of another famous “humorous” blues song, Bob Dylan’s “Leopard-Skin Pillbox Hat.” In “Dust Me Down,” written by Ben Harper, the twelve-bar blues format illustrates its capacity for endless reinvention; quirky chord substitutions contradict, but do not undermine, the expected harmonies, yielding an edgier musical construction to complement the heavily distorted guitar that drives the song. In my opinion, “Strong Man Holler” is the strongest selection on Maestro. It is the only slow twelve-bar blues (more or less) on the album, and is remarkable for the poignant vocal timbres Taj Mahal achieves as he moans in the lowest part of his register. The verses of this song, moreover, are remarkable for treading the boundary between singing and heavily rhythmicized speech. The biggest pitfall of Maestro is in its production. Although several individuals shared production duties, the sound they achieved is too homogenous. Distorted guitars and the Hammond B3 organ dominate the sound, leaving the other instruments to coalesce quietly in the background. Thus, Toumani Diabate’s virtuosic kora playing on “Zanzibar” sometimes gets lost in the texture, as does some of Taj Mahal’s banjo playing throughout the album. In all, I recommend listening to Maestro, but I fear that its overly homogenous sound, as well as its occasionally generic songwriting, may cause its allure quickly to become used up. This entry was posted in Blues and tagged Contemporary blues, Folk-blues, Modern acoustic blues by aaamc. Bookmark the permalink.